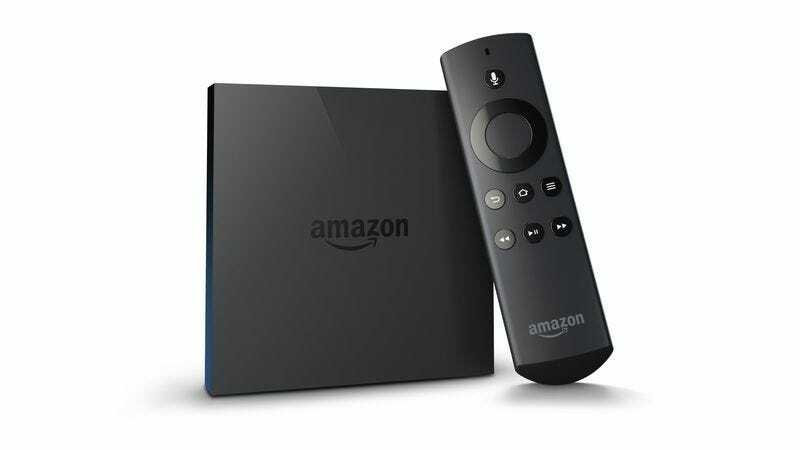 At a press event earlier today, Amazon announced the Fire TV, a small device with the ability to play Netflix and also perform other functions. Selling for $99 and available today, the small box offers Watch ESPN, Hulu Plus, Vimeo, and other channels whose colorful icons will delight viewers while they locate the Netflix app on the screen. As a promotion for its new device, Amazon hired Gary Busey to listen to a bell. The Fire TV’s most notable feature is voice search, which allows you to speak your desired entertainment into the Fire TV’s remote. You might close your eyes and whisper “The Kids In The Hall,” for instance, in the hope that Kids In The Hall reruns have finally returned to Netflix streaming. (They haven’t.) Apple’s Siri and Microsoft’s Kinect have proven that voice-control features seldom work as well at home as they do in a rigged onstage demo, but as Gary Busey points out, even a half-decent voice search is probably preferable to the drudgery of tap-tap-tapping around an onscreen keyboard. Amazon also boasts that the box has a quad-core processor so that Netflix can recommend Aziz Ansari stand-up specials faster than ever. Games are a big part of the Fire TV, too. EA, Disney, and Ubisoft are among the major studios that will be supporting the Fire TV—most likely by shoveling a handful of mediocre games into the Fire library while they wait to see whether this thing takes off, as they do with most upstart gizmos. Users can play simple games with the Fire TV’s included remote or buy the $40 Amazon Fire Game Controller, specially crafted for the company by the Soviet Brutalist Institute Of Controller Design. The Fire TV announcement is sure to be welcomed by users who wanted a way to watch Netflix on their TV but weren’t quite sold on the Roku, Xbox 360, Boxee, Chromecast, Wii U, PlayStation 3, TiVo, PlayStation 4, Xbox One, WD TV, Wii, or Apple TV.